All lamb and rice diets are not the same. Many dogs that have to be on allergy formulas don’t eat very eagerly because they prefer the taste of chicken to lamb. Some dogs develop a dry, flaky skin condition. 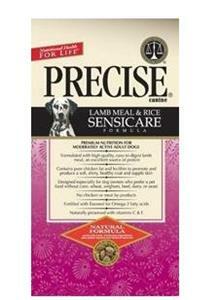 Precise Sensicare Formula is different. Because pure, clarified fat has no allergens, we use chicken fat in our formula. The result is a lamb meal and rice food your dog will eat more eagerly, without any allergic reactions. And chicken fat, together with the lecithin in Sensicare, will result in a superior skin and coat condition. Lamb Meal, Ground Brown Rice, Ground Oats, Rice Bran, Flaxseed, Chicken Fat (preserved with Mixed Tocopherols and Ascorbyl Palmitate), Lecithin, Natural Lamb Flavor, Choline Chloride, Calcium Ascorbate (source of Vitamin C), Zinc Amino Acid Chelate, Yucca Schidigera Extract, Vitamin E Supplement, Iron Amino Acid Chelate, Manganese Amino Acid Chelate, Cobalt Amino Acid Chelate, Biotin, Vitamin A Supplement, Calcium Pantothenate, Niacin, Pyridoxine Hydrochloride (B6), Thiamine Mononitrate (B1), Vitamin B12 Supplement, Vitamin D3 Supplement, Riboflavin Supplement, DL-Methionine, Menadione Sodium Bisulfite Complex (source of Vitamin K activity), Folic Acid, Copper Amino Acid Chelate, Sodium Selenite, Calcium Iodate. • Divide the recommended serving amount into two meals per day. • In addition to food, always make sure fresh water is available. • Vitamins, minerals, and other supplements are not necessary. • When switching foods, adjustment should be gradual. If a loose stool persists beyond three days, consult with Precise Pet Products or your local veterinarian. • Feeding amounts may vary by breed, activity level, temperament, and climate. • Pregnant or nursing dogs may need food available at all times. I received my order of Precise dog food today and BOY, was I surpised to see my dogs actually go crazy for their food. My two Beagles ate it quick and begged for more once they were done! Very good quality ingredients in this formula with lots of calories per cup so you feed you dogs less. I would recommend this food if you are having any sensitivity type problems or just want a good all round healthy food for your dogs.